Home » Cutting the cord » The end of TV or just the end of the aerial? The end of TV or just the end of the aerial? The House of Lords have proposed that Britain should move all TV services to the internet and free the airwaves for mobile services. On the surface, this looks like a bold statement, and in many ways it is, but it’s also a safe bet. The writing has been on the wall for a while now. Take a look at my entries on “Cutting the Cords,” and “Beyond HD” for a bit of context on the delivery of media over the internet. In the minds of many in the broadcasting world, the fallback position for universal coverage is still a battery-powered transistor AM radio. It’s very interesting to see that the Peers believe that the internet will be the best way to reach underserved communities. One thing to keep in mind – if the airwaves are used for mobile broadband, and TV and radio move to IP-only distribution, these services will still be available over the air – just using a different method. If that were to happen, then the biggest stumbling block will be commercial, not technological. As long as carriers in the UK insist on maintaining data usage caps, viewing and listening will remain limited. In my own case, I used 200 GB of data on my wired broadband connection last month. All of our TV, radio and voice communications are done over that connection. When winter comes, and we’re cocooning in front of the fire, I can see using significantly more data than that. Another unintended consequence of such a move will be a massive change to the look of the UK. 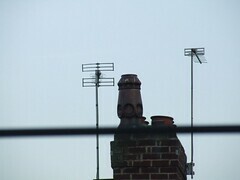 My first trip to the UK was a holiday in London in 1972, and I noticed that the British skyline was defined by two things – chimney pots and TV aerials. A move to IPTV would return the roofs of the UK to their Victorian configuration. And where will the pigeons roost?